If you do not have elementary-aged children, you probably have yet to hear about the Diary of Wimpy Kid movies. They're actually based on a very successful series of books by Jeff Kinney. My older boys love the books and well, they love the movies also! 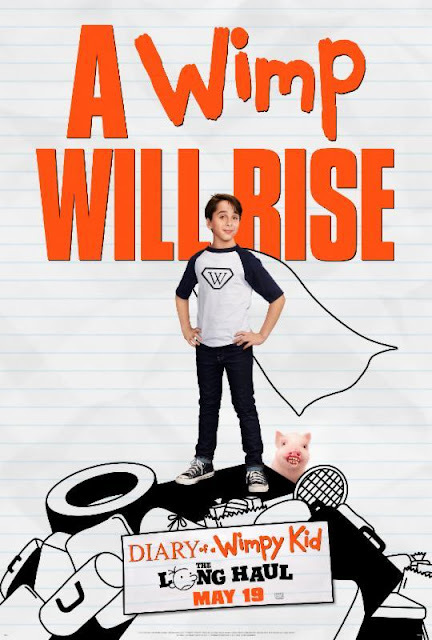 Diary of a Wimpy Kid: The Long Haul is the fourth movie in the series. This movies follows the entertaining Heffley family on a long road trip to Meemaw's 90th birthday celebration. In true Greg-form, the plan changes and chaos ensues. The cast includes: Alicia Silverstone, Tom Everett Scott, Charlie Wright, and Jason Drucker. Fans of the movie series will notice that the entire cast is different, but don't fret: these actors totally nail the mannerisms that we have grown to love. The original "Greg" has grown up and it was said to be bad timing for the other actors. This movie was full of laughs! As a parent, there were several scenes that I could totally relate to. Toddler sleeping in your bed and ends up sideways with his feet in your face? Yep. When your toddler takes a nap, you do everything in your power to ensure he doesn't get disturbed. YEAH REALLY! Showing off pictures of your naked babies in bathtubs? C'mon, who doesn't have one of those! Diary of a Wimpy Kid: The Long Haul will be in theaters starting May 19, 2017!